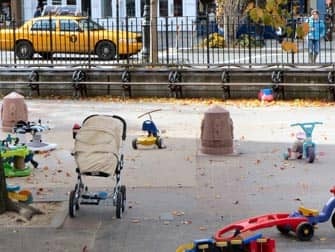 Playgrounds in New York are not only a meeting place for children, but especially for their parents and nannies. 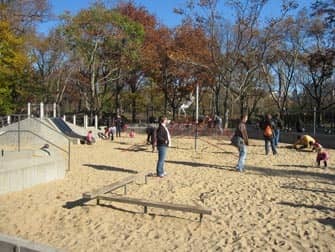 There’s a wide range of playgrounds in New York City: big, small, hip or casual, for very young kids or for older ones. 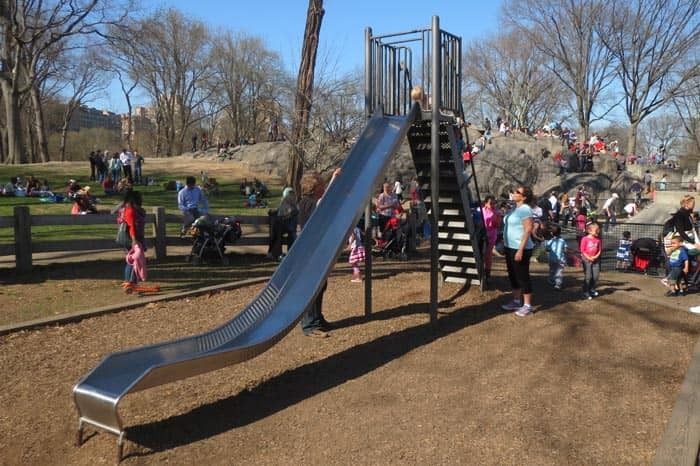 On this page you’ll find the most fun, freely accessible playgrounds in New York for children ages 0 to 12. Find out what else you can do with your children in New York. A morning or afternoon spent at a playground in New York isn’t just a treat for the children. The Central Park Playground, for instance, is beautiful with the many skyscrapers in the background. Besides that, it’s a pleasure to watch all of the people, while your child is making friends with one of the boys or girls that live on Park Avenue or wherever. 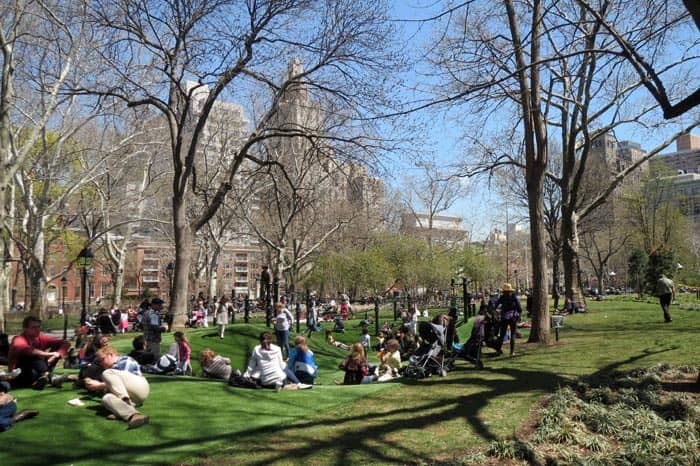 Go and mingle with the locals in a New York playground! 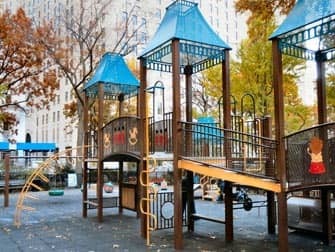 Seeing as Manhattan is full of large and small playgrounds, you will come across quite a few during your stay. 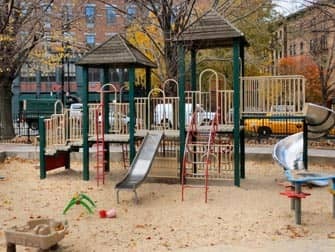 Some playgrounds, like Bleecker Street Playground, have their own website and receive substantial donations from local residents. These are the more ‘prestigious’ playgrounds; having your child play there makes them one of the cool kids. It’s all about top-of-the-bill strollers, exclusive designer clothes and Starbucks Babyccino’s (cappuccino with only milk foam). The playground has plenty of toys available for children to play with, as long as you put them back where you found them before leaving. Taking pictures of other children is definitely not done. So: don’t! The perfect moment for a playground visit is during lunch. Enjoy a sandwich in the sun, while your children are keeping themselves busy. Plan your day carefully – playing is exhausting! In case you have other activities scheduled, don’t stick around the playground for too long. A lot of playgrounds have (clean) toilets with a changing table, but not all of them. Climbing frames, seesaws and a big sandpit make this a pleasant playground, but it’s definitely the spot to see and to be seen. Plus: the location across from the original Magnolia Bakery is outstanding! Expect crowds during the summer. 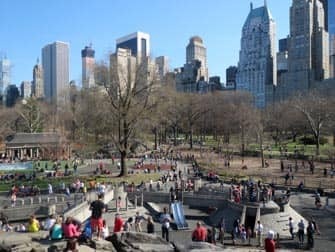 There may be many playgrounds in Central Park, but this one has a sandpit, numerous slides, rope courses and other play equipment, which makes it the biggest and the best. Plus: the location near the Fifth Avenue and Columbus Circle skyscrapers is simply spectacular. Find more info on Central Park here. You can find this nice playground close to Jane’s Carousel in Brooklyn Bridge Park. With a fun nautical theme, all the climbing frames and the sandpit are in the form of boats. The centrepiece is a boat form with slides, climbing elements, bridges and a huge mast! 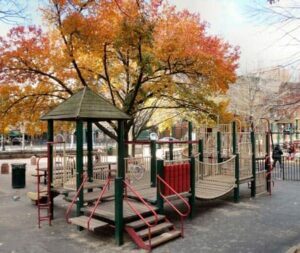 The Main Street Playground is surrounded by trees and is situated almost under the Manhattan Bridge. 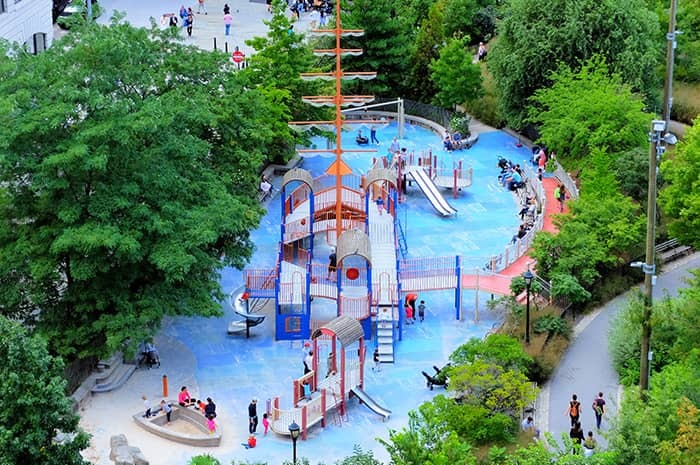 This Brooklyn playground is located at the Brooklyn Bridge Park waterfront. Even though it’s small, the view is amazing. Note: the playground itself is meant for the younger ones, but in the rest of the park there’s plenty to do for older children. Older children might be up for crossing the Brooklyn Bridge. Hidden behind Madison Square Park’s tall trees, you’ll find a small playground. With a climbing frame, swings and a 5-meter high water fountain (during in summer), it’s the perfect place for a quick lunch outside. Get lunch from nearby Eataly (before noon to avoid crowds). One of the main playgrounds of Manhattan. This one has swings, tunnels, slides, a water fountain and a lot more. During the weekend there’s a nice market where you can buy delicious juices and sandwiches, when the kids want a break from playing. This playground has a slide, rocks to climb on and sprinklers. 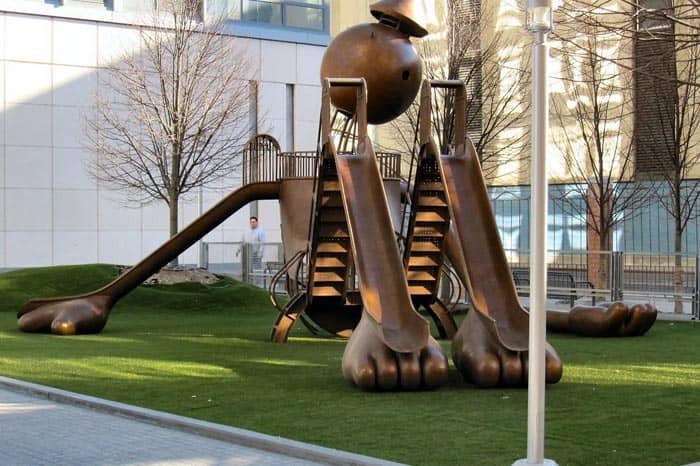 What makes this playground so special though, is the Tom Otterness slide. This artist is very famous in New York – he also created the sculptures at the 14th Street subway station. Here you’ll mostly meet children who live in the surrounding 53-story tower. 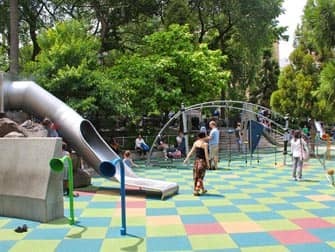 In this park you find several playgrounds, and because of the size of the park, you’ll be able to find them all easily. There’s a huge fountain for the children to play in, a play-field with fake grass for the little ones and one with slides and climbing frames – all newly renovated. Highly recommended! 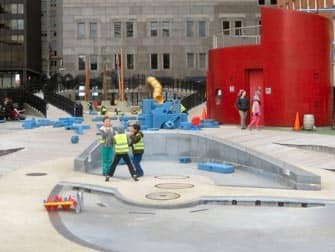 At this playground children can play with sand, water and loose ‘bricks’ made out of foam. It encourages them to use their fantasy. 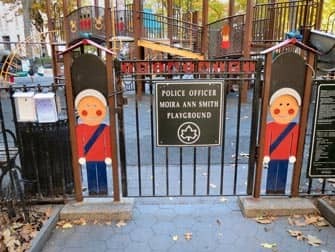 The most fun playground in downtown Manhattan! 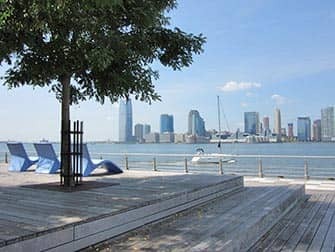 This playground is located at Pier 25 next to the Hudson River. That means that your kid can play here by the marina with the little boats, as well as views of New Jersey and One World Trade Center. 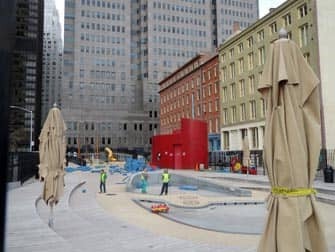 The Pier 25 play area has different playgrounds. So there is a baby play area, but also a playground for three- to seven-year-olds with climbing frames and a real climbing wall. In the summer, there are also water activities to do. 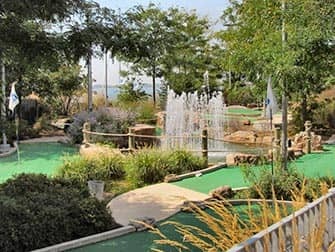 The special feature of Pier 25 is that there is also a beautiful 18-hole mini golf course where you can make use of it for $5. This includes the materials! 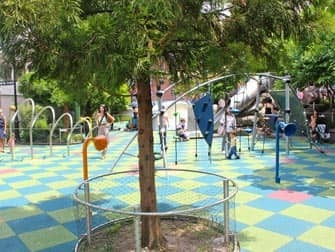 This is the most beautiful playground in TriBeCa and because of its location, it is also the prettiest for the parents that come along.